My estimated timeline for this little box was a little (INSANELY) off. But my Dad's temporary loss is your gain, or at least not your loss, and I think this project is going to make for some cool blogging, and eventually a nice cigar box. I had the idea for the humidor after Tim and I found a mahogany pallet near the freight elevator on the way back from a necessary summer iced coffee break. It was my first fancy-schmancy pallet find, although now that I know that thars gold in them thar hills I've been seeing them more often. 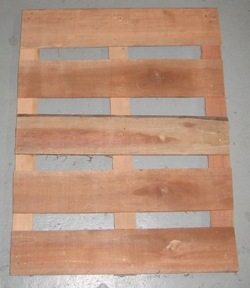 I used our Gramercy crowbar to pry the pallet apart. Big ups to South/Central America for using staples, and not spiral nails, to hold together this stack of exotic tree. From the dismembered bits I selected a hefty bunch and slung them over my shoulder for the bike ride home via Greenwood Cemetery (RIP eco-lumber). 1: Good job Joel, if the Lord had wanted you to smoke cigars he would have stamped them Norris. 2: Really? 70% Humidity is going to dissolve my glue? Its 70% in Brooklyn as I write this. 3: While the box interior should remain static at 70% humidity the exterior and marquetry will be exposed to seasonal changes. To me this sounds like a recipe for disaster, and yet the collected wisdom of millions shrugs and says "dunno, It just works"
Is a marqueted humidor a fools quest? 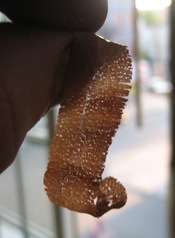 Will the humid interior melt the hide glue so necessary for hammer veneering? Will the shifting exterior surfaces buck like a bronco against the stable interior and send veneer and splinters shooting in all directions? Will Father's cigars taste like eau d'retired-race-horse?!? ENOUGH! Be gone, doubt! I'm just going to do this, and if the marquetry falls apart and the box dissolves (or explodes) into a pile of True-Blood-dead-vampire-slime, so be it. Close observation revealed just how checked and cupped the pallet wood was, but careful work with my sash saw and hand planes brought everything into shape. Because its been so humid and hot here lately I planed the wood to flat, and let it sit a week before planing it flat again. I did this twice before the wood stopped moving. Perhaps this shows how fool hardy NYC summer time wood working is, but I enjoyed seeing a former pallet become expensive looking mahogany stock. I used my saw hook as a shooting board to square the ends of my boards and trim them to exact length. I've tried this move with my old number 3 plane, but it just didn't work that well. This time with the Clifton #4 it worked quite well. My new Clifton is quickly turning me into a snob. The dovetails on this box will be covered by veneer so for kicks I gang sawed the tails. I like gang sawing for its "Look Ma, no hands!" quality. I trimmed the joints to fit nicely with my Mk2 chisels, and then glued the sides of the box together. With the sides glued my friend Max helped/learned how to plane a dovetail flush. It was his first time using a hand plane on a real project and he did an impressively good job. Nice tease with the hammer. Go with hide glue, was never a problem before 'modern' glues. I have a late 19th century cigar box that is still stuck together with hide glue. Steve- What hammer?!? Just Kidding... Two sizes coming this Fall. Late gifts = family tradition. Nice to see you keeping it up. Gramercy crowbar???? Who let the mule into the thoroughbred stable? Mule!! Who you callin' a Mule!?! Do you typically cut the tail end waste out without reclamping the boards horizontally? Or is this because you're going to veneer it? 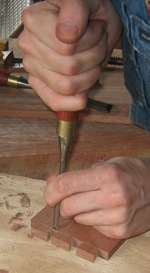 Joe- This is pretty much the same wasting technique I always use for wasting dovetails, exposed or hidden. It allows you to quickly waste away the two end immediately after you've finished cutting the tails without ever having to reclamp or set down your dovetail saw. In this case, I sawed a little above my line to allow for paring with a chisel in the next step. That mahogany looked so beautiful after you planed it! I have lots of pallets in my warehouse if you want to drop by. Hard to get home on your bike, though.